« The NEW Mommy Living the Life of Riley Rewards Program ~ Because I LOVE My Readers! Speaking as a vain woman on a budget, finding quality beauty products which won't break the bank can be a challenge. But this year, my search has just gotten a lot easier. I've been chosen to participate in the H-E-B Beauty Bloggers program and I'm so excited to do so! Each and every month, I will be bringing you the H-E-B Beauty Pick of the Month with plenty of chances to nab some great prizes too! Orchid skin care products are January's feature and I had the chance to sample four targeted beauty items guaranteed to help put your best face forward. Keep reading to learn more! The Orchid brand of beauty products from H-E-B offers you a complete line of gentle solutions to address a variety of skin-specific needs. This way, you can select your own personal Orchid regimen which can proactively combat common skin conditions such as swelling, dark spots and enlarged pores. I had the opportunity to try four of the Orchid skin care products (Anti-Aging Eye Roller, Firming Lift Face Serum, Acne Spot Treatment and Thermal Clay Mask). The Orchid Acne Spot Treatment contains 10% benzoyl peroxide and will help treat breakouts by releasing micronized benzoyl peroxide deep within the pores. Although it contains the maximum strength amount of benzoyl peroxide available over the counter, it's still gentle enough for everyday use. Next up was the Orchid Anti-Aging Eye Roller. This unique beauty buy uses a precision applicator to roll on focused skin-renewing hydration that reduces eye puffiness. The anti-aging formula also helps to reduce the appearance of fine lines and wrinkles around the delicate eye area. I really loved this product for it was just so easy to use and apply as it thoroughly hydrated the skin around my eyes. It also successfully worked its mojo on my early morning puffy eyes too. As I've gotten older, I've noticed more wrinkling and damage to the skin around the eye area and I hope that the Orchid Anti-Aging Eye Roller will continue to keep this area moisturized and refreshed. The Orchid Firming Lift Face Serum provides the hydration of luxurious moisturizers that renew and refresh skin. The silky light fluid absorbs quickly and works to tone and firm the skin. I appreciated how quickly my skin soaked up this face serum and how light it felt. It can be applied both day and night but you should allow the serum to dry completely before using another moisturizer. My winter skin has definitely been crying out for more moisture and the Orchid Firming Lift Face Serum is a wonderful addition to your skin care regimen. It's hard to gauge whether or not this product is helping to lift and tone the skin since these results typically take a long time to see. Finally, we come to my favorite Orchid product...the Thermal Clay Mask! This mask helps improve your skin's appearance by exfoliating dry skin cells on the surface, revealing newer, younger-looking skin underneath. Because of the drying effects of the winter season, I find that a quality clay mask is essential for sloughing off that dry skin and keeping your face looking fresh. The Orchid Thermal Clay Mask is water activated and gently warms the skin to relax and open up your pores. This warming action ensures that clogged pores and blackheads are rinsed away with the mask itself. I loved how smooth and supple my skin felt after using this beauty product and recommend it highly to anyone needing a quick facial pick-me-up! Of course, one of the best features of the Orchid skin care line from H-E-B is how budget-friendly these items are. You can conveniently pick them up while you do your grocery shopping and the price for all four is typically what I pay for at least one product. Now that's a beauty bargain! 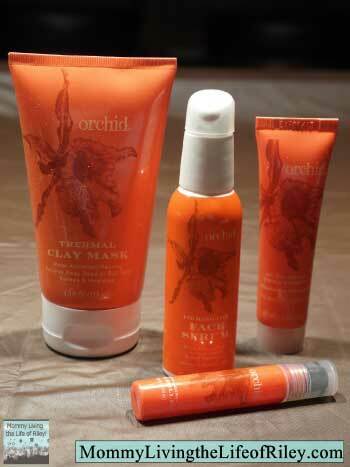 Disclosure: I received the four Orchid skin care products shown above from H-E-B in order to facilitate my review. No other compensation was received. This product review is based on my own personal experiences with this item and is completely honest and objective.